Although dates aren't exactly a low-calorie food, they can be part of a low-calorie diet without causing weight gain as long as you eat them in moderation. They provide fiber, magnesium, potassium, copper, manganese and vitamin B-6, making them a more nutritious way to satisfy a sweet tooth than cakes, pies and candies. 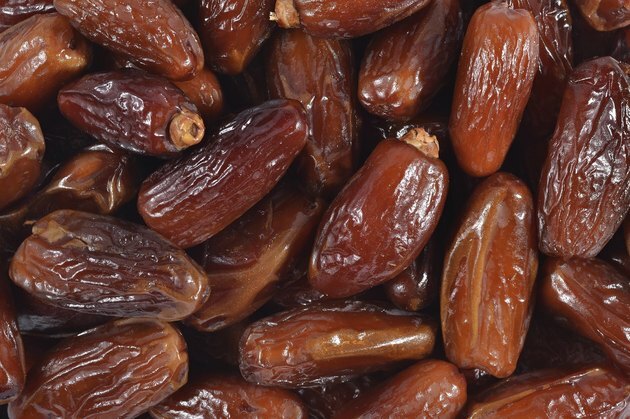 The larger medjool dates contain 66 calories each, and a serving of four of these dates has 277 calories. Watch your serving size because the calories in these fruits can really add up. Eat a cup of the smaller deglet noor dates, and you'll be consuming 415 calories. Dried fruit in general tends to be higher in calories than fresh fruit, which is why the Academy of Nutrition and Dietetics recommends adding more dried fruit to your diet if you're trying to gain weight. Fiber slows down the emptying of the stomach, helping you feel full for longer. It may increase satiety and decrease the number of calories you get from carbohydrates, fats and proteins, helping you lose weight, notes a review article published in March 2005 in the journal "Nutrition." Each medjool date provides 1.6 grams of fiber, or 6 percent of the daily value, and if you eat four of these dates, you'll get 6.7 grams of fiber, or 27 percent of the DV. Dates have an energy density of 2.75 calories per gram, which falls into the medium category that also includes foods such as whole-wheat bread, hard-boiled eggs and part-skim mozzarella cheese. Foods that are low in energy density, including fresh fruits and vegetables, are best for weight loss, especially if you eat them before foods that are higher in energy density. They help you fill up while eating fewer calories. The most fattening foods are those high in energy density, such as bacon, butter, cookies and crackers. Eating dates instead of other foods that are higher in calories and lower in nutrients is the best way to fit them into a healthy diet. Eating four dates is a better way to satisfy a sweet tooth without going over your daily calorie budget than eating cake or pie. A slice of chocolate cake with chocolate frosting has almost twice as many calories as four dates, with 537 calories, and a slice of apple pie is also much higher in calories, with about 411.